I-CAR received a huge bump from State Farm’s announcement that all Select Service shops would need to finish its welding program, but the welding series had already been on the rise. After this and some other events in 2016, “our welding activity picked up dramatically,” she said. “We continue to build on it,” Quadrozzi said. Quadrozzi and other I-CAR officials sat down last week to discuss the growth and future of the program — which will include more frequent retesting to maintain one’s credentials. I-CAR certifies technician welding capability with three courses: “Steel MIG Welding” (WCS03) and “Steel Sectioning” (SPS05) courses must be passed by Dec. 31, and “Aluminum MIG Welding” (WCA03). Business development director Nick Notte said shops for now were primarily opting for the two steel courses over the aluminum one. “We’re seeing the two steel courses really take off,” Notte said. In the first quarter of 2015, 1,603 students had completed one of the three courses, according to I-CAR. By the first quarter of 2016, that number had grown to 2,366, up 47.6 percent. By the first quarter of this year, it had leveled off, rising 3 percent to 2,440 — but State Farm’s move and increasing aluminum on the market are likely to spur another bump. And some of the initial boom of students have likely moved on to their second course, but would only have been counted once. As of March 31, 2017, 1,973 shops have a technician current in all three I-CAR welding courses, according to I-CAR. Shops tell I-CAR they don’t want to weld or section structural aluminum, declaring, “‘I’ll straighten hoods all day long,'” Notte said. But the reality was that “there’s a ton of aluminum out there to weld,” he said — which raised the question of how it was being welded. As more of the metal comes on the market amid aggressive OEM lightweighting efforts, “we believe we’re going to see more and more of those shops” seeking aluminum equipment and training, Notte said. Notte indicated he wished he could make the courses sound more elite by declaring a 50 percent failure rate, “but it’s not.” However, the pass rate isn’t 100 percent either, he said. The instructors see it as “a personal challenge” to teach a student well enough that they pass — though they won’t “coach you through the test,” according to Notte. “Our instructors are crazy about welding,” he said. An instructor will help a student practice and prepare — one even kept technicians to 2 a.m. until they were ready to do it right — but once practice ends, “that’s it,” Notte said. The student is then on his or her own — one shot, one take, while the instructor is silent. Those who pass don’t need to retake the test for another five years — but that could soon change. Along with other changes over the next year and a half, “we are going to be moving that requirement,” she said. I-CAR also addressed complaints from some shops that its WCS03 and WCA03 courses are too easy. Notte described I-CAR’s welding courses as focused on the immediate need — getting some kind of formal welding training to the 69 percent of the industry lacking it. “We offer a pretty valuable option,” Notte said — repairers could get an eight-hour crash course rather than cease work for days of training. And welding students who start out not wanting to be in class for those eight hours leave saying, “’I didn’t know what I didn’t know,'” or “’I haven’t been doing it correctly,’” according to Notte — an indication that the class had value and was needed. “We have testimonial after testimonial from the techs,” he said. Instructors “to a man” suggest that were the test given at the start of the class, 50 percent of students would fail outright, Notte said. According to Quadrozzi, WCS03 was meant as a prerequisite to the far more rigorous structural aluminum SPS05, and I-CAR’s expectation is that a steel structural technician wouldn’t stop at ProLevel 1 but complete all the training (including SPS05) to achieve Platinum status. SPS05 is challenging, Notte said, recalling one luxury-certified critic of WCS03 who took SPS05 and was “blown away” by its rigor. But WCA03 doesn’t lead in to a harder “201-level” course the way WCS03 does with SPS05 or have the difficulty of an aluminum luxury OEM’s testing, according to critics. “We’re not going to be operating at the level of a Mercedes or a JLR,” Quadrozzi said; I-CAR is meant to meet a broad industry need. I-CAR also has an structural aluminum course — a sort of SPS05 for aluminum — “in the works right now,” according to I-CAR welding product manager Adam Schutz. I-CAR hasn’t yet determined if that class will join the educational organization’s “hands-on” offerings or its more formal welding certification curriculum, he said. Vehicles are changing, and joining methods are changing with them to methods outside of what would traditionally be considered “welding.” Rivets, structural adhesive and MIG brazing are just some of the techniques being required for collision repair on common later-model vehicles. Recognizing this trend, I-CAR is offering courses covering these methods as part of its “hands-on” series, which like the welding courses must be conducted within the applicant’s shop. “MIG Brazing Hands-On Skill Development” (BRZ02) and “Rivet Bonding” (RVT01) (which also includes structural adhesive, according to Schutz.). Proportionally, Schutz said, the growth in the hands-on courses is “as big as what we saw” with the 2016 welding boom. “That’s just going to continue,” he said. 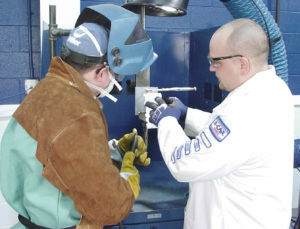 Asked if these techniques would be elevated to the level of a welding certification class, Schutz said “that’s definitely open.” However, such elevation would likely wait until more vehicles demanded the techniques and OEMs developed more uniformity in their requirements (since the certifications are meant to show industrywide best practices). I-CAR also has hands-on courses in the works for spot welding and plastics, including a plastic welding class, he said.